Four months ago today, I stepped onto AeroMexico flight 543 from Mexico City Benito Juarez International (MEX) to Oaxaca Xoxocotlan (OAX), and made Oaxaca de Juárez – or Oaxaca, Oaxaca, as it’s often referred to – my home base. As I had hoped when I started out on this journey to Mexico, it has been quite an adventure. The year I spent living and working from Buenos Aires, Argentina in 2009 was the trial run, and now the stage is set for an ongoing series of life abroad experiences. As my friends have heard me say all too often, I hate travelling but, for the record, I love living in other places. Waking up to a place that is new, and that I’m slowly getting to know, makes every day a bit more fun. Given that I’m not a huge fan of unnecessary travel, I’ve spent most of my time in the city of Oaxaca. That said, I thankfully have friends that pulled me away for a handful of little outings, like an overnight trip to Hierve el Agua that involved a gas can of local mezcal, a week-long stay in San Cristobal de las Casas, Chiapas, and a magical few days on the beach in Mazunte. But, I have yet to make the time to visit Monte Alban, which is probably only twenty minutes away. These are all baby steps. My Spanish is nowhere close to where I would like it to be (admittedly, I’ve not put in the effort). 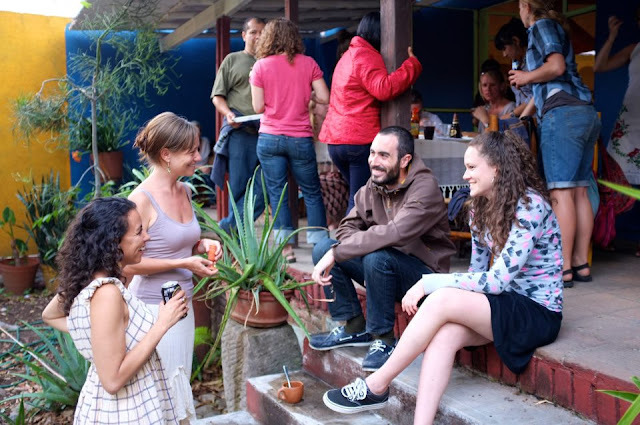 The Clandestine Oaxaca Appreciation Society shows the potential for something really interesting – like an evolving guide to living in Oaxaca, by a unique group of young, progressive individuals – but I don’t have the time to push it forward at the moment. I have a lovely home for hosting, but I’ve only managed to organize one gathering so far. So, there is still work to do. What I miss most about Canada, obviously, is being close to my friends and family. I also miss amazing Quebec cheeses, ample charcuterie options, and quirky little local bars where people know each other by name. And, maybe just a little bit, I miss high-speed Internet – though I’ve gotten used to having to consider what movie I want to watch in advance, so I can start the download three or four hours ahead of time. Perhaps there should be a movement around “Slow Internet,” as it does provide some of the same advantages of slow e-mail? In just two short weeks I’ll start the journey back toward Toronto, via New York and Vancouver, and I wonder what I’ll miss most about Oaxaca when I’m gone. Perhaps the organic market where I spend Friday and Saturday mornings having breakfast and conversations in the shade with friends? Maybe the lively scene and endless new culinary experiences of lunch in Parque El Llano on Friday afternoons? Definitely, waking up to sunshine and mountains every day. I won’t have to miss it for long, however, as I’ve decided to make Oaxaca home base until next February or March. After a summer with friends in Toronto – involving lots of cheese and charcuterie – I’ll slowly make my way back to my little “casita” in Xochimilco, where I now own a grill among other small life-improving appliances, to re-double my efforts to learn Spanish and to achieve my dream of becoming a first-class slacker.